I spent time this weekend finalizing my freezer cooking plan as well as getting some shopping in. BIG batch cooking is on the agenda this week. While I still shop at a number of stores, Costco is often my go-to spot for groceries when bulk cooking. There are some great deals to be had, though their meat prices are not as competitive as they once were. How does Costco compare in price to Sam’s Club? We just had a Costco open in our area it is about twice the drive from home and I was wondering if it would be worth it to switch? We have both. The prices are generally pretty comparable, with some items being a little more at one store and vice versa. In my personal experience, the quality of items is much higher at Costco. The customer service level is also miles apart. Even as tight as my budget is, I choose Costco hands down. Also, I don’t know your philosophy on credit cards, but if you don’t mind using them, Costco has an AmEx that earns cash back. It’s an annual rebate for purchasing groceries and gas, which pays for my membership and then some. I pay mine off every month so I am not incurring any nasty interest charges that would negate the rebate. I recall Sam’s would accept Discover, but I’ve never used that brand so am not sure how their cash back program works. @Stephanie, I don’t live near any Sam’s. But, when we lived in KC, we had memberships for both for one year due to some special or something. They have similar stuff and similar prices, but Costco is a little more upscale in both price and quality. Kind of like Target compared to Walmart. They also have good prices on quinoa and organic brown/wild rice. Unless mushrooms are on a fantastic sale at a grocery store, I get those from Costco also. I don’t have a produce box option, though, so I don’t know how that compares. Frozen veggies, too – mixed vegetables, Normandy blend, organic green beans, organic broccoli florets. Those are staples in my freezer. For snacks, the big plastic jars of pretzel sticks are a decent price. Corn and flour tortillas, bananas and romaine lettuce are on our Costco list. Also the restaurant sized plastic wrap and foil are a good deal. I love Costco too.. I buy my coffee there too in addition to some of the things you mentioned. I buy their boneless frozen chicken breasts exclusively.. I refuse to buy any other. I buy my olive oil there too. I’m debating whether or not to get a Costco membership. It’s $55/ year where I live so I’m not sure I’d get that savings back in a year. There are only 2 of us but I’m trying to cut down on our grocery bills. Today, I needed feta cheese for a potluck I’m going to and it was $6 for 5 oz. at the supermarket. That’s a lot for my budget. Do you think that Costco savings outweigh the membership fees? I do. There milk, cheese, and butter are the best price where I live. And hubs gets the best gas price there, too. I know that we break even for sure. Well, we more than break even, because we upgraded to the higher level one and get cash back from our purchases as well. 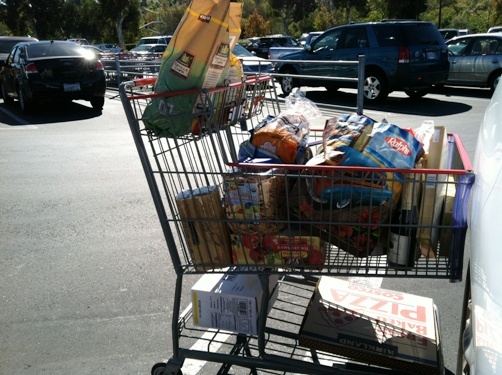 We’ve been Sam’s Club members for years, and only very recently has a CostCo opened nearby. I took the free tour and it looked like a great store and pretty much the same as our Sam’s. Prices were about the same, sometimes a little higher, sometimes a little lower. Since we already have the Sam’s membership ($45 per year) I think we’ll stick with that. THANK YOU for the tip on buying maple syrup in bulk. I do NOT want to buy any more of the fake syrup but the little bottles of the real stuff kill the budget! Sam’s has a 32 oz bottle for just under $11 – I think that will last us quite a while! Rather than hunt for sales/coupons I always buy our paper products in bulk at Sam’s. Paper towels, T.P., tissue – one bulk pack of any of those lasts us a while! I get laundry detergent there – fabric softener, ziplock bags for all my freezer cooking!!! 🙂 Vinegar! Two big jugs for about what one would cost me at Meijer. When DS was a baby we bought the store brand of diapers and wipes and saved a ton! It also a great way to save on dog food! It sounds like I shop there all the time, but I really don’t. The purchases I make just last us a while! And I try to space them out through out the year – so we don’t have such a hit on our wallets!